The layout of your garden is as important as how you decorate inside, but it often doesn’t get the same attention, or budget. Yet the garden is often the main focus of life for months of the year, with barbequing, parties, and just general lazy around outdoors. As well, every estate agent will tell you that an attractive and inviting garden adds dollars to the value of a home and makes it so much easier to sell when the time comes. It seems that in most families, wives do the inside decorating, and the guys are expected to take care of the outside. Faced with a garden, it can be hard to know where to start, or what to do, even if you have a vision in your head. If this sounds like you, or if you find yourself looking at a garden, and not knowing where to start, then read on. The first thing to do is consider what your garden is for. A play space for children? A party area? Just to look at? Make a really simple sketch plan of your lot and mark on it the areas you want, and where they should be. Consider that a children’s area should be easily seen from a kitchen window, or another room where you are likely to often be. Now, do you want these areas to be lawn, or hard surfaces? Areas with no particular function can be planted with ground cover, or mulched. Hard surfaces can be expensive to install, while lawn is always the cheapest way to cover a large area – and usually best for children too. Keep paved areas big enough for their purpose, but don’t just pave everything, unless you have a small garden. Nobody likes to take the ‘long way round’, so consider how you would approach these areas from the house, or from each other. Does your layout make logical sense, and allow for quick access? Especially with children and dogs, it is best to respect what designers call ‘desire lines’, which is nothing more than the shortest distance between two points. It is always best to make that kind of direct flow possible, otherwise you need some solid barriers to redirect people against their natural inclinations. The next step is to see where you need screening, and where you might want to use internal hedges to separate functional areas of the garden. For example, a vegetable garden can be enclosed with a few wires with fruit bushes like thornless blackberries growing on them. Other areas might want hedges but remember that hedges need regular trimming. 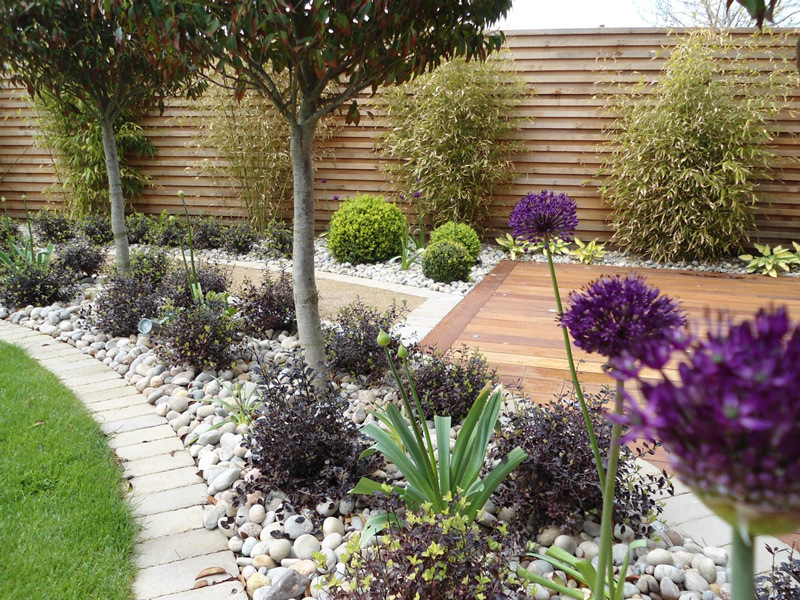 Maybe an informal screen of shrubs – they could be a single type, or mixed – is a better long-term solution that will take a lot less maintenance. There is always a temptation to grow strange and exotic plants, but it is best to resist it. Most of the plants you grow should be easy in your zone, just adding a few special plants to see how they do. If you are new to the area, take a look at what is growing well in your neighbors’ gardens. You might need to ask them for names, and the person with the best garden around is probably the one who will know them. The best way to avoid having a garden that is the same as everyone else is to use newer, less common varieties of the same plants they are growing. As an example, consider crape myrtles. These have been around for a long time, but there are many new varieties, in better colors, and now with dark foliage. If you see lots of old types around, then you know these new varieties will do well, and give you a different, more modern look at the same time. Look around your garden space and think about what you need. Do you need shade over some areas? Be careful about creating too much shade, as there are not so many plants that will grow in it. Just shade the areas you need. For an interesting garden you need plants of different heights. A few taller trees (or big shrubs in a smaller garden), combined with lots of plants in the 2 to 5-foot range, and then lower-growing plants beneath or in front of them. Try to include plants that flower or have interest at different times of year. Be sure to have some shrubs for later in the summer, like hydrangeas for example, and things with fall color, winter berries, and interesting bark. Spring is easy, since many plants bloom then – you would have to work hard to have a garden that wasn’t color at that time. Especially in small gardens you want plant that are interesting at more than one time of the year, and colored leaves are an easy way to keep things colorful for long periods of the year. You don’t need to do everything at once. Buy some plants you think will work well, and that you like, and spread them around. Once they are established, think about what might work in between them, or in other areas you haven’t planted yet. You can take several years to complete your garden, and you often avoid mistakes by taking your time. A big error is to plant one of everything. Repeating the same plant around the garden gives a look of continuity and calm. Choose half-a-dozen plants you like, and that are easy to grow, and then plant them all over the place, perhaps in different colors, if they exist. Don’t worry too much about color – gardens are very forgiving of color clashes, and all the green softens colors, so most things look just fine. Finally, don’t overplant. Nothing looks worse than the garden where all the plants are crowded together in a jungle. Best to allow plenty of room for maturity, especially with the trees and large shrubs. Get out a tape and measure – you will be surprised how much room a mature plant is going to take up. A newly-planted shrub bed should look pretty bare – if it doesn’t you have probably over-planted it! Put down organic mulch over the bare spaces, like compost or shredded bark. This will reduce weeds, conserve water, and improve the soil, while allowing each plant to grow without competition. Filling the spaces with annual flowers and short-lived plants is tempting, but it usually slows down the growth of the plants you want for the long-term, and sometimes smothered them completely. Best to keep the space around them open – they will soon grow in! If you take this approach, without worrying about the sort of detail usually done in garden plans, you will be surprised how easy it is to put together a satisfying garden that reflects your own personality and taste, but one that is also easy to use, while easy to care for.